President Donald Trump is itching for a trade war. No matter what you do for a living, that should scare you. In a trade war, countries impose tariffs and other barriers on imported products, often in retaliation for actions taken by a trading partner. That can slow down business activity around the globe by crimping international trade. In a worst case scenario, trade wars can lead to a global depression. Protectionist trade polices are one of the primary factors economists cite for deepening the Great Depression. 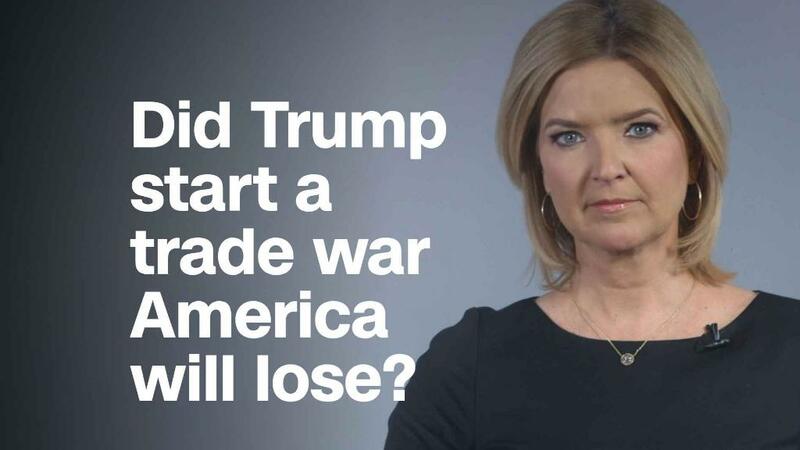 So if there's one thing that most economists agree upon, it's no one wins a trade war. But President Trump doesn't believe that. He tweeted out Friday morning that for the United States, a trade war is "good" and "easy to win." This much is certain. In a trade war, US consumers and businesses will be left with the bill. President Trump says he's planning to impose a 25% tariff on imported steel and a 10% tariff on imported aluminum. That means the price of cars, appliances, packaged food and everything else that uses steel or aluminum is bound to go up. Even the aluminum industry's trade group admits the smelters remaining in this country cannot make enough additional aluminum to replace the supply coming from overseas. When the tariffs are put in place, imported products will continue to come in -- at higher prices. Since foreign steel and aluminum prices will be higher, domestic producers are likely to raise their prices as well. Yes, America buys more from other countries than it sells to its trading partners. But don't discount the amount of goods and services the United States does export -- $2.3 trillion worth. A trade war by definition means that other countries are going to slap tariffs and restrictions on those US goods and services, making them more expensive, and less competitive -- if they're allowed into those countries at all. And once an American business loses a contract to sell its products overseas, it can take a long time to win that business back. Their customers will find other, perhaps more dependable suppliers while the trade war is waged. Many well-paying jobs are at risk in a trade war. In 2017, the United States exported $60 billion worth of auto parts, $56 billion of civilian aircraft, $52 billion of new cars and trucks, and $51 billion of pharmaceuticals. That's only goods. The United States has been primarily a service economy for decades now. Today about five times as many jobs are in the service sector, such as finance, media, transportation and retail, than are in goods producing sectors, such as manufacturing and mining. The good news is that the United States had a $243 billion services trade surplus. The federal deficit is big and getting bigger. The Committee for a Responsible Federal Budget estimates the deficit could swell to $1 trillion by next year. Wall Street worries that the rising amount of debt could drive up the interest rates on the government debt, since the Treasury Department will have to offer higher rates to borrow more money. That would increase the cost of borrowing for consumers and businesses, since many types of loans -- including mortgages -- track government bond rates. One thing keeping rates in check so far is the demand for US debt from overseas. America's foreign trading partners, including China, are among the largest buyers of that debt. It added $127 billion to its holdings last year and now owns more than $1 trillion in U.S. debt, making it the largest foreign holder of our debt. The trade deficit that President Trump decries is one of the reasons for those holdings. It gives foreign countries a powerful incentive to buy that debt, since they have to do something with the dollars they get back on those sales. If the trade gap shrinks, for whatever reason, China won't have as much incentive to buy US debt, and interest rates could rise significantly.